Page revised in February 2017. The locations covered in this section were visited in October 2013. This small building is made more imposing by its symmetric design and by its location on slightly elevated ground. It is surrounded for miles and miles by a barren landscape with no other buildings in sight. It has the appearance of a fortress, but its towers and buttresses are solid and they serve a structural and decorative purpose, rather than a defensive one. 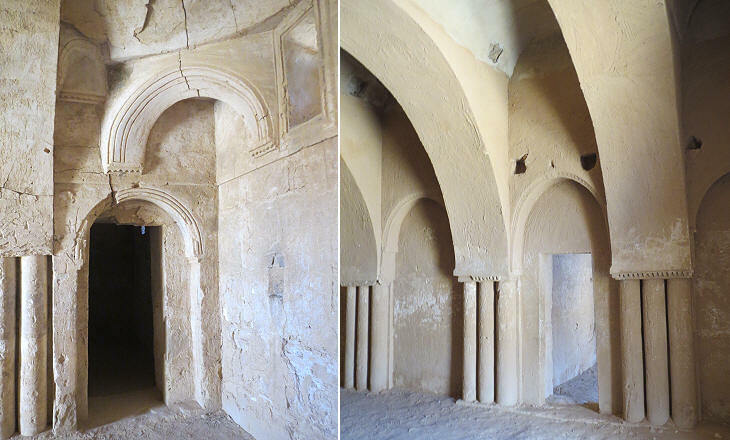 The lack of a system to capture rainfall indicates that Qasr al-Kharanah was used on a temporary basis only. It was built before 710 by the first Umayyad Caliphs to be used by their representatives for meetings with leaders of Bedouin tribes. The interior of the building had some stables on the ground floor and several rooms on the upper one. The size and architectural design of the upper floor rooms indicate that they were meant for important guests. 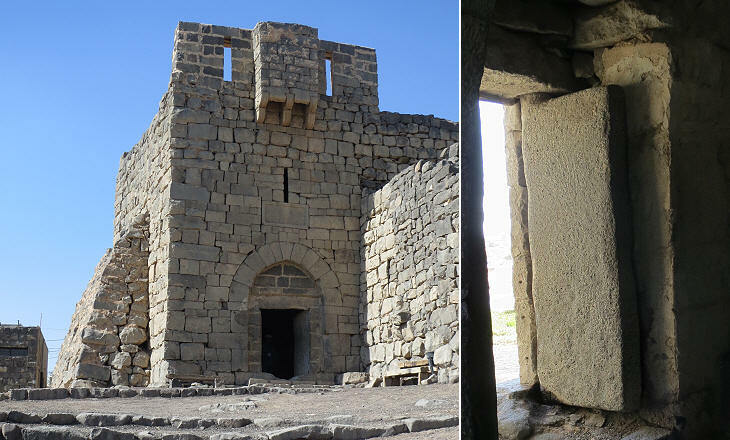 The design of the exterior of Qasr al-Kharanah, with its small round towers and buttresses, was most likely an example followed in the construction of larger Umayyad "desert castles" such as Qasr al-Hayr al-Sharqi in Syria. Graecia capta, ferum victorem cepit (Captive Greece conquered her savage conqueror) Horace - Epistles 2.1.156. Horace had in mind the impact of Greek culture on the Romans, but the sentence could apply to the Muslim Arabs who conquered Byzantine territories too. 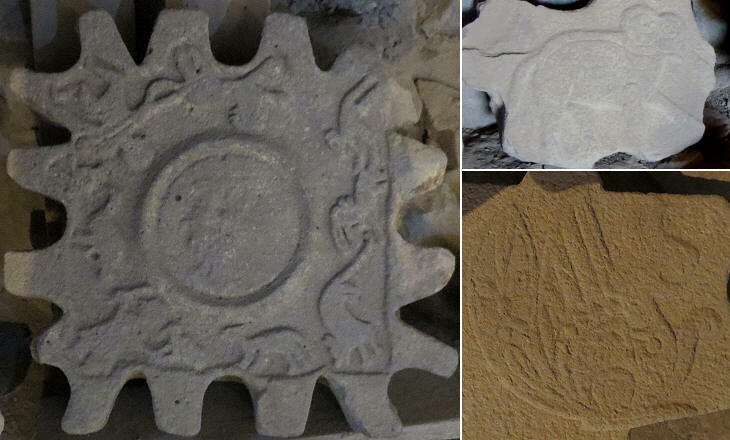 The Umayyad caliphs who set their residence at Damascus were fascinated by the heritage of the Roman/Byzantine Empire. 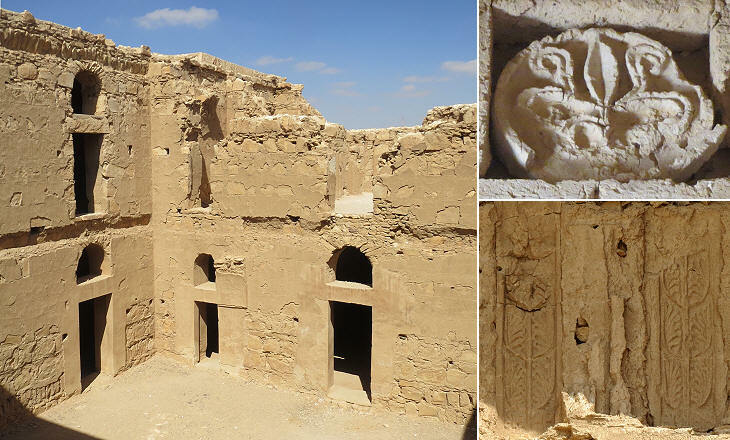 Qasr al-Hamra was built as a faraway residence where they could live in a classic ambiance, without being seen and being accused of impiety by their Muslim subjects. You may wish to see Anjar, an Umayyad town in Lebanon. The size of the hall and of the adjoining baths indicate that very few members of the court accompanied the Caliph to this palace. They must have been very trusted persons, because the decoration of the building was entirely at odds with the Muslim prohibition of portraying human beings. 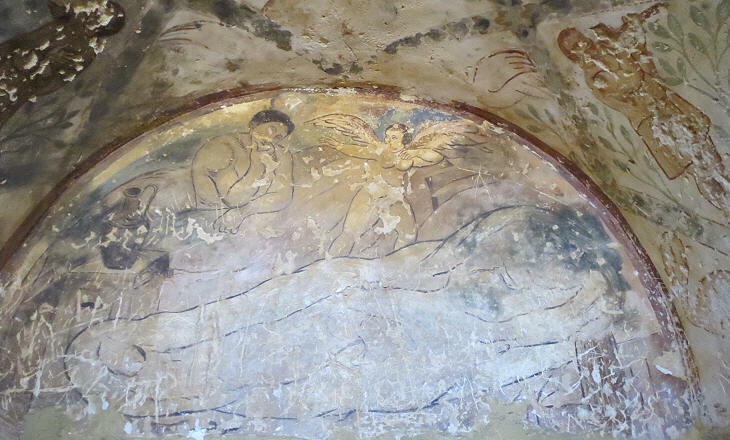 The frescoes which cover all the walls responded to a complex iconographic symbolism. The men at work shown above were probably an allegory of the positive effects of the Umayyad good government. Chronicles report that when the Arabs conquered Persia they found that some royal palaces were decorated with series of portraits of Sassanid rulers. 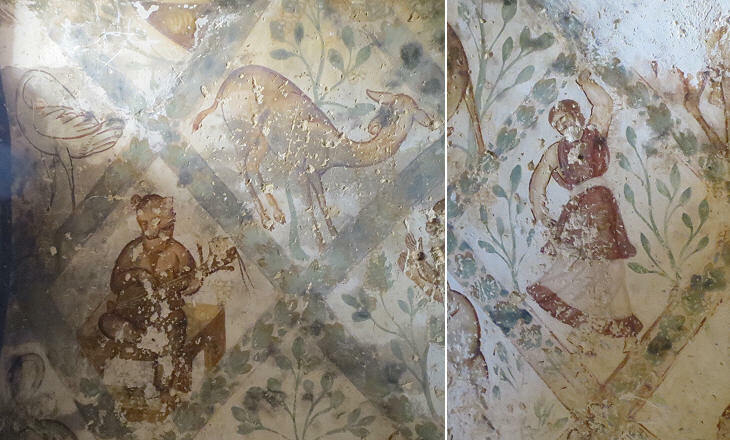 This might have influenced the decoration of the apse of Qasr al-Hamra with the portraits of six foreign kings paying tribute to the Caliph (whose portrait has been defaced). 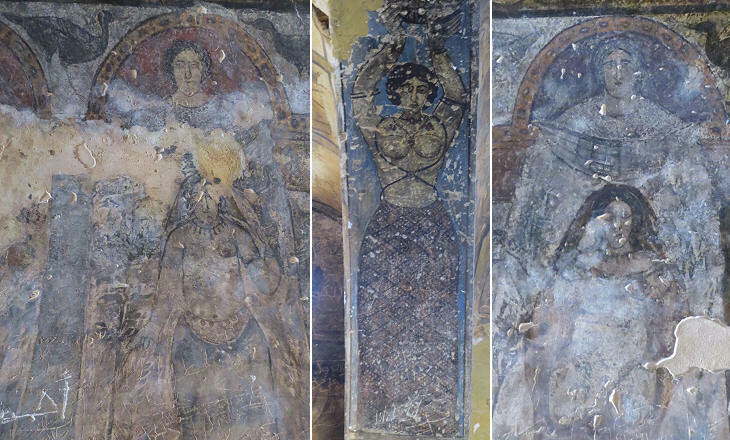 The figures of female dancers which complete the decoration of the hall were perhaps prompted by mosaics such as the Aphrodite and the Artemis of Philippopolis, where the bosom of the goddesses was given special emphasis. The bath adjoining the main hall, although very small, was divided into the three sections (calidarium, tepidarium and frigidarium) of Roman baths. Its decoration could be interpreted as having a sexual connotation, but the nakedness of the women depicted on some walls could be motivated by the desire to imitate the classic tradition of placing statues of naked gods and goddesses in public baths. 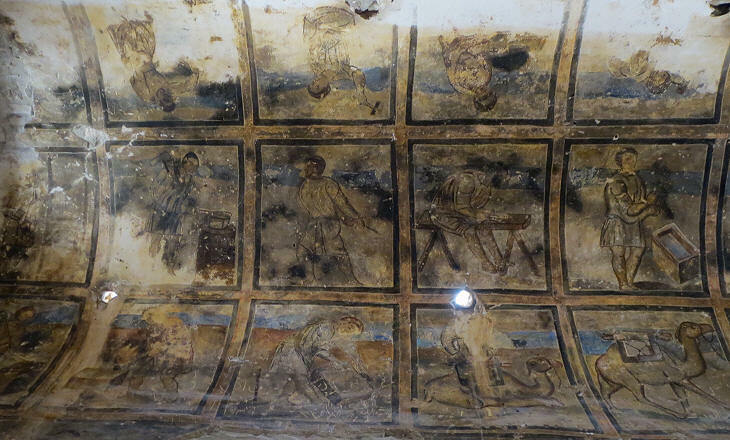 One of the ceilings of the bath is decorated with a variety of subjects, mainly animals, perhaps suggested by the many mosaics which depicted Orpheus taming the animals playing the lyre. The bear playing a sort of guitar could be a representation of Callisto, the nymph of Artemis who was turned into a bear by Zeus. Later on, when she was about to be killed by her unaware son, Zeus turned her into Ursa Major (the Great Bear Constellation). The story of Callisto is narrated among others by Ovid and it was very popular throughout the whole Roman Empire. According to Ovid, Callisto, although having the appearance of a bear, retained her gentle heart. The Great Bear and the personifications of other constellations are still visible in a very interesting depiction of the sky. Muslims rapidly assimilated the astronomical knowledge of the conquered civilizations including the Indian one. 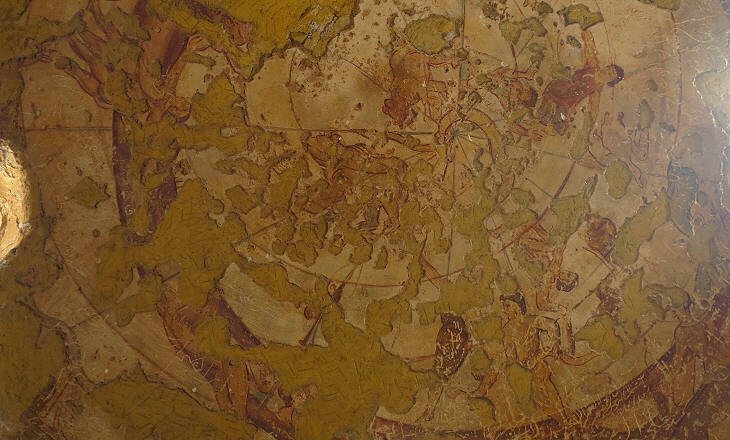 They then developed their own system of astronomy, which however retained the geocentric approach developed by Claudius Ptolemy in the IInd century AD. 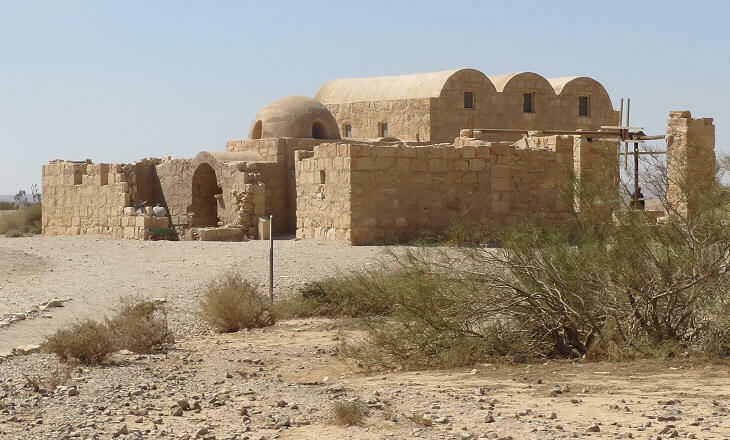 Qasr al-Azraq is the only "desert castle" which deserves this name. It was built as a fortress by the Romans and it was strengthened in 1236 by a local emir. It is situated along the main road between Jordan and Iraq. 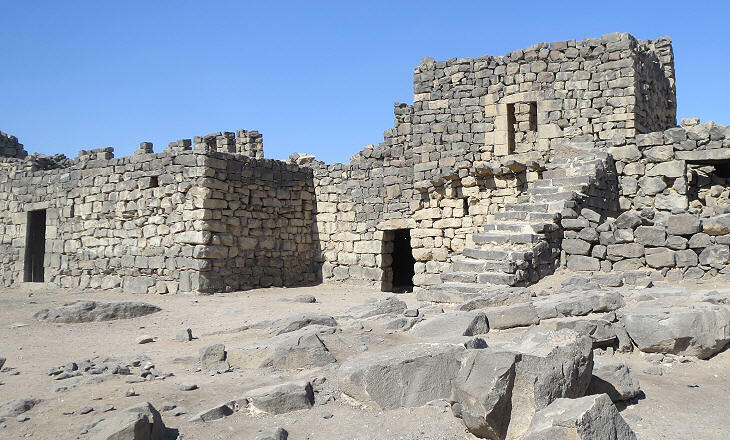 Because of the basalt stone with which it was built it ought to be called the Black Castle, rather than the Blue Castle (Azraq means blue), but the name derives from the abundance of water in the environs of the castle. It was to be Ali's first view of Azrak, and we hurried up the stony ridge in high excitement, talking of the wars and songs and passions of the early shepherd kings, with names like music, who had loved this place; and of the Roman legionaries who languished here as garrison in yet earlier times. Then the blue fort on its rock above the rustling palms, with the fresh meadows and shining springs of water, broke on our sight. Unfortunately at the beginning of the 1960s water from the oasis started to be pumped to Amman and the swamps dried up by the mid-90s. 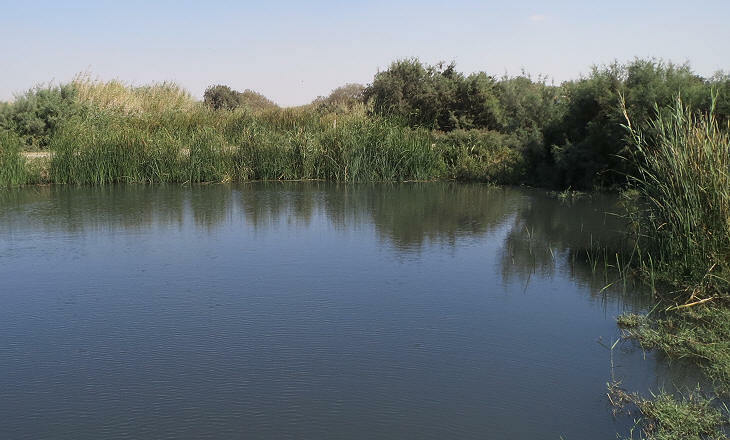 Wetland has been restored on a small portion of the original swamp, mainly to provide migrant birds with a much needed stop in their journey across the desert. The Romans built the fortress to restore their rule in the region, most likely immediately after Emperor Aurelian had defeated and captured Zenobia, Queen of Palmyra. The revolt she led had greatly damaged the image of Rome and Aurelian and his immediate successors decided to locate several garrisons in the region, including Palmyra itself where Diocletian built a fortress. 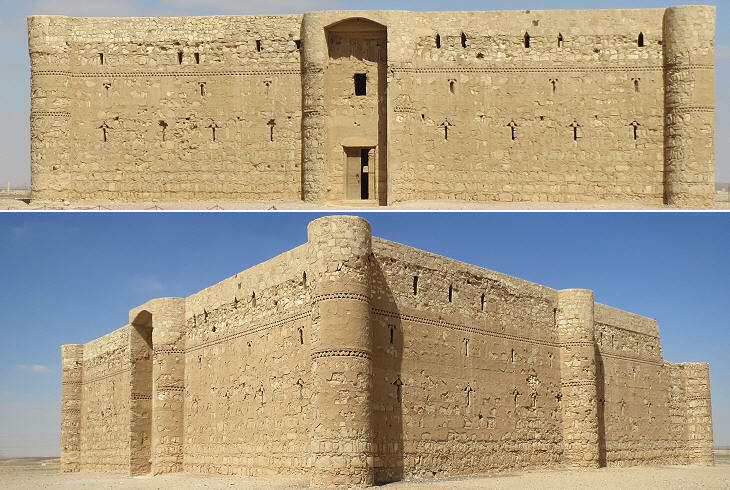 The restoration and enlargement of Qasr al-Azraq occurred during the last years of the Ayubbid rule. 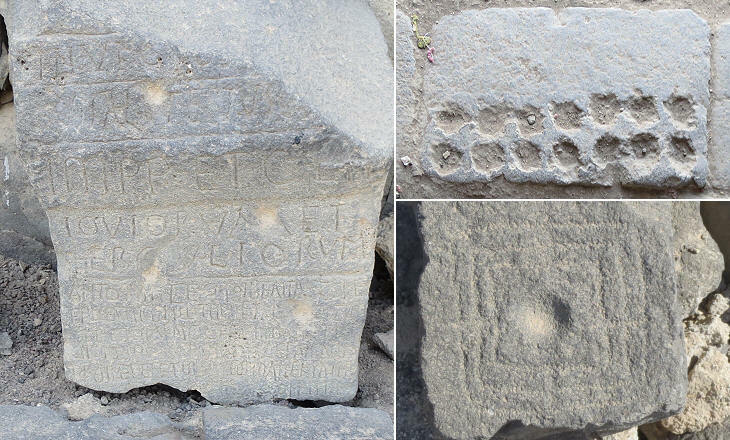 An inscription at the entrance indicates the year 1236 and the founder, the Emir of Salkhad, a town and fortress in the Hauran region (the fortress was destroyed by the French in the 1920s).